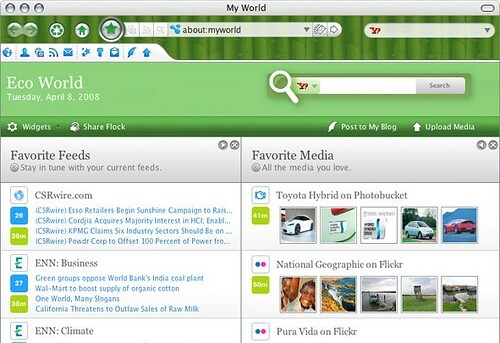 Firefox spinoff Flock calls itself the "social web browser" because of its tight-knit integration with social websites like Flickr, Facebook, and Twitter. The new Eco-Edition comes pre-loaded with a lovely green theme and self-updating content from environmentally-focused blogs and media sources from all over the web. Flock Eco-Edition is a free download, and Flock has pledged to donate 10% of search proceeds to an environmental charity chosen by the Flock community.